On Thursday, Root himself said he was looking forward to the time when his leadership mettle would be examined. On the first day of the second Test, where South Africa moved on to 309-6, Root got his wish and, in turn, allowed the pressure to ease off the Proteas on more than one occasion. It was a fluctuating day - South Africa were attritional in the first session, fluent after lunch and had to recover following a four-wicket collapse in the evening. They were helped by England opting to use Liam Dawson ahead of fellow spinner Moeen Ali and again in the sleepy overs in the run-up to the second new ball. I'm not the only one confused by England's approach to Moeen, with both Root and coach Trevor Bayliss saying that he is now seen as the second spinner. When confidence is high - as Moeen's should be after taking 10 wickets at Lord's - it is reasonable to expect players to perform for you. Therefore, I was surprised when left-armer Dawson, despite what the England higher-ups are saying about his place in the pecking order, was used before Moeen at Trent Bridge. Put simply, we know that Moeen is good enough at this level, but the same cannot yet be said about Dawson, who is playing in only his third Test. Indeed, Dawson was the most expensive of England's bowlers, often providing a release for the South Africa batsmen. It was almost as if Root felt like he had to bowl him simply because he was in the side. In all, the six bowlers that England have in their side is probably too many. It creates a problem for the captain in juggling them, and perhaps even puts doubt in a bowler's mind in that he may be thinking that he has to perform well quickly otherwise he will be replaced by one of the many other options. I would prefer to see England play an extra batsman, even if that does push the talented Moeen down to number eight. The make-up of this side is not one I expect to be mirrored during this winter's Ashes series. When England knew that the new ball was approaching, they allowed the game to drift, fiddling overs from Dawson and Keaton Jennings. It was almost as if they were waiting for James Anderson and Stuart Broad to take the wickets, rather than using the other two of their four seamers - Ben Stokes and Mark Wood - with the old ball. Often, the whole point of a new ball is that you are using it against a new batsman. England may have missed a trick by taking the foot off the gas at that moment. Root's other issue on Friday was the use of the review system, with both of England's referrals frittered away inside 24 overs. On both occasions, headstrong bowlers in Stokes and Broad wanted reviews, only to see that their lbw appeals were turned down for pretty obvious reasons. It's tricky for Root, because the new captain has to feel his way in, not only with the technology, but with experienced bowlers, of whom he wants to gain their trust. In these situations, bowlers are always likely to be biased, with a more streetwise skipper less likely to be concerned by their demands for a review. 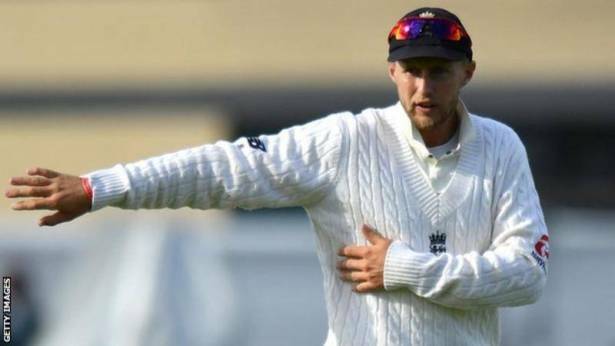 It is something that Root will learn from and he may well be saying to his players that more discussion is needed to ensure they get the reviews right. All in all, it was an excellent day of Test cricket that leaves the match set-up for the weekend and beyond. South Africa's Quentin de Kock, a freescoring left-hander, made batting look terribly easy before playing a horrible shot, while his opposite number Jonny Bairstow goes from strength to strength behind the stumps for England. 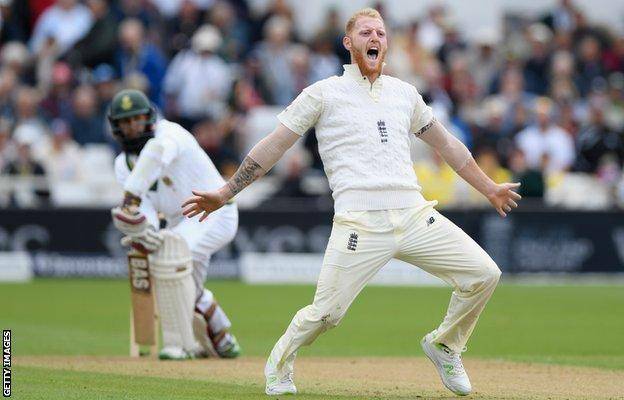 After taking a wonderful catch at Lord's, Bairstow took a similar one here to remove Proteas captain Faf du Plessis. From being a keeper who made one mistake per Test, Bairstow has made a massive improvement. There has been talk of bringing in Jos Buttler to allow Bairstow to concentrate on his batting. I can tell you that Bairstow would be devastated if the gloves were taken from him. There was a lovely moment for Anderson, who became the bowler to take 300 Test wickets in England, but I thought he bowled a little too short, especially with the second new ball. Broad, on his home ground, was the pick of England's pace bowlers. It was Broad who took two wickets after tea to begin the South Africa collapse, only for Vernon Philander and Chris Morris to steady their situation. Their efforts have left the contest wonderfully even.